The 2008 SAMSUNG New Printer Design Identity, namely, ‘Bizmm’ represents human touch in the machine design that is beyond today’s modern machine look. It connotes the beauty and the spirit of human in the machine. 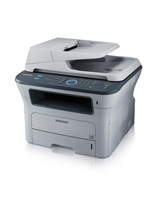 The SCX-4828FN has design of an office machine that looks very unlike a machine. By employing round and organic body style, the shape of SCX-4828FN has design presentations which are pleasing to human eyes and hands, ergonomically beautiful, and harmonious to any office environment. Only 50db print noise and 53db copy noise. The S-Compass helps you navigate for accessing variety functions, Clockwise circular motion indicating task progress. Print and copy two page documents. Forgot to print double sided? There is a one touch button on the printer that allows you to print double sided even if you have already started a job.